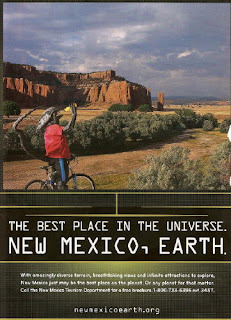 The latest tourism ad in NM Magazine shows one of our alien friends biking. That must not be an easy task with a tail like that. Is that water or acid he is drinking? Either way it is a good idea to keep hydrated. It looks like it may rain soon, he best summon his ship to come pick him up.